Peneques (Stuffed Tortillas) Recipe | Good. Food. Stories. Even if you don’t live in Los Angeles, San Diego, or Austin, you don’t have to travel far to get an authentic street taco these days. Excellent Mexican food is everywhere, from Rick Bayless’ empire in Chicago to ballpark food like Floyd Cardoz’ El Verano Taqueria in the Northeast. At once comfortingly familiar and enticingly exotic, Mexico City culinary staples like esquites and elote or carnitas are now happily standard fare across America. 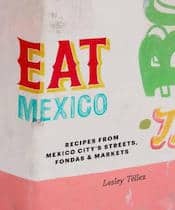 And as much as I’d love to travel to Mexico City and sample from market stall to stall, eating mole and sipping aguas frescas at countertop restaurant stands, I can recreate the flavors at home with Eat Mexico: Recipes from Mexico City’s Streets, Markets & Fondas by Lesley Téllez. 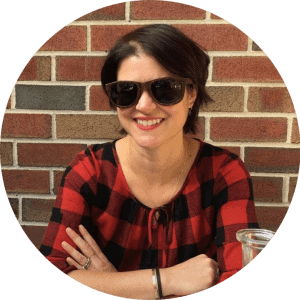 Lesley, a friend and fellow food writer who runs a Mexico City food tour company of the same name as the book, takes us on a virtual trip through the city’s markets, fondas, and surrounding countryside in the pages of Eat Mexico. Her stories and recipes, based on her explorations of Mexico City’s food scene, make us immediate intimates and experts at her side. Though Lesley cautions us that “there are very few shortcuts in Mexican cooking,” there are still a number of recipes in Eat Mexico that will satisfy without spending an afternoon at the stove. Sure, there are traditional preparations like slow-cooked pork shoulder and step-by-step instructions for making your own stack of fresh corn tortillas (as well as making fresh nixtamal and grinding it into masa, if you’re so inclined!). 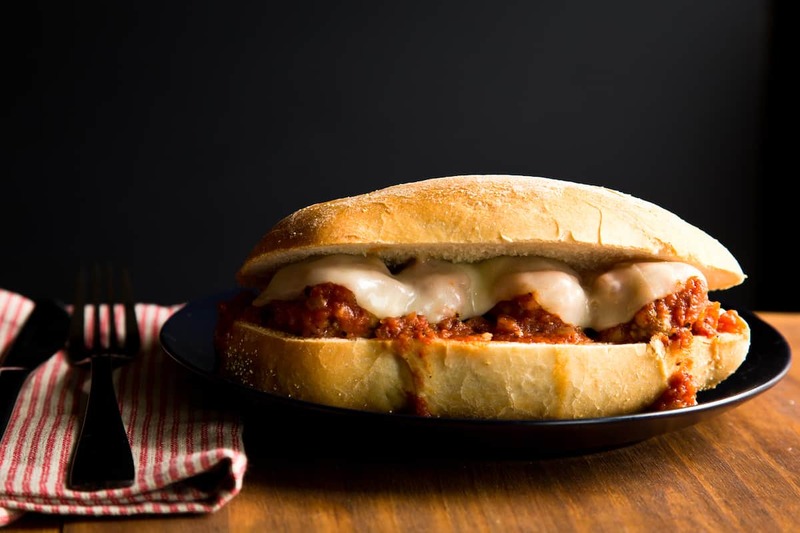 But whether you’re looking to expand your cooking roster or find something comforting and familiar, you’ll find enough to explore without feeling like you’re embarking upon a full day’s cooking quest. Like tender, savory albondigas al chipotle simmered in spicy red sauce (above), for example. They’re no more time-consuming or difficult than the more immediately familiar Italian version. Or bean and cheese tlacoyos, crispy masa patties that enclose a simple homemade bean-and-cheese filling. Top the tlacoyos “con todo” (with everything), as Lesley recommends, or try your hand at making homemade crema or one of the rainbow roster of salsas in the book as accompaniment. Among the new-to-me recipes throughout the book, one of Lesley’s discoveries from Mexico City’s market stands—peneques, or puffy corn tortilla pockets—seems 100 percent tailor-made for this season summer eating. Stuffed with green beans and squash rounds, dunked in a light and crispy egg batter, and quickly pan-fried, peneques are one of those dishes that works from brunch to dinner. 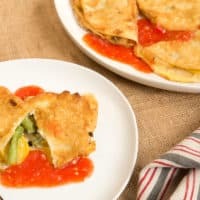 They could be little omelets or alternatives to huevos rancheros; handheld snacks that replace a lunchtime sandwich; or a full meal with beans and rice on the side. And peneques are surprisingly easy to pull together once you get your assembly line going. If you’ve ever dipped and fried your own tempura at home, you’ll find the process of cooking the peneques to be no big thing, and even if you’ve never batter-fried a single thing, the near-magic of watching the fluffy egg batter puff and sizzle is a must-do at least once in your life. Although after you’ve done it once and eaten the results—especially with fresh, spicy ranchera sauce—you’ll definitely want to do it again. 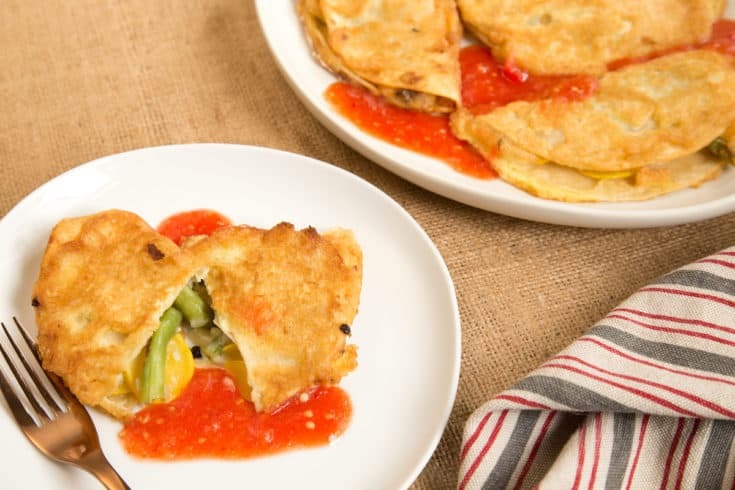 Peneques—puffy battered stuffed tortillas—stuffed with vegetables are a great seasonal meal. 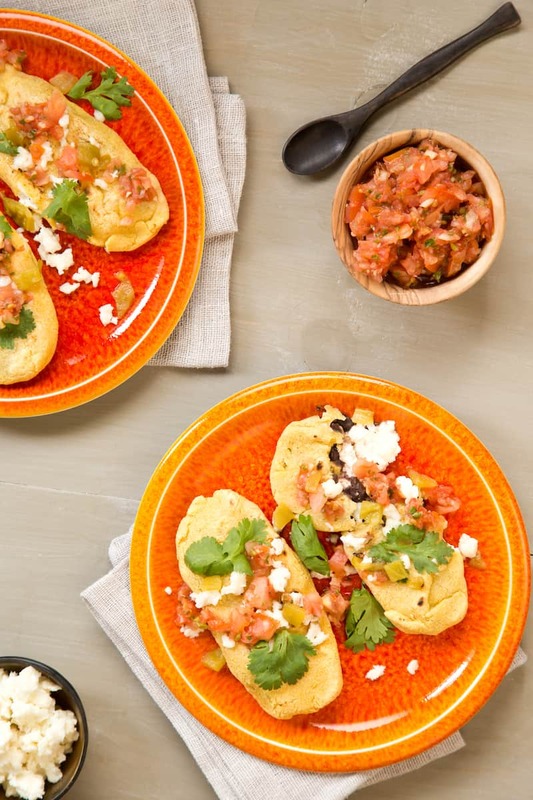 Try this recipe from the book Eat Mexico with your favorites. Uncover and cook, simmering gently, until the tomato flesh softens and the skins start to split, about 8 minutes. Pluck the tomatoes out of the water as they soften and transfer to a bowl or cutting board. The chile and onion may take a few minutes longer than the tomatoes—the chile is done when the skin darkens and becomes slightly matte, and the onion should be translucent. When all vegetables are cooked, move them to the cutting board to cool. Reserve 1/4 cup cooking water and ditch the rest. Stem the chiles and chop roughly. Place them in a blender with the onion and garlic. Slip off and discard the tomato skins, add the tomatoes to the blender and blend until smooth. (You may need to do this in batches, depending on the power of your blender). If the sauce seems very thick, add the reserved cooking water and blend again until smooth. Season with salt, adding more to taste. Bring to a boil, then lower the heat and simmer gently until the flavors meld, stirring occasionally, about 5 minutes. Keep warm if using immediately. Heat 2 teaspoons canola oil in a large skillet or high-sided saucepan over medium heat. Add the onion and garlic and cook until translucent and aromatic, stirring often, 2 minutes. Add the green beans and a few pinches of salt. Stir well to coat in the onion-garlic mixture, then add 2 tablespoons water. Reduce the heat to low, cover, and cook until the green beans are just tender. Add the squash and another pinch of salt, and stir well. Raise the heat back to medium and cook uncovered, stirring often, until the squash is tender and translucent. Whisk the egg yolks together with 1 teaspoon flour and 1/2 teaspoon salt in a small bowl. Whisk the egg whites with a stand mixer or electric mixer until stiff peaks form. Using a rubber spatula, gently fold the yolks into the whites. The egg whites should be fluffy and frothy, and the yolks completely integrated. Create an assembly line next to the stove with the filling, cheese, flour for dredging, batter, and a plate or cutting board for filing the tortillas. Place a wire rack on a rimmed baking sheet in a warm oven (about 200 degrees F). Warm the tortillas in the oven or in a clean skillet, a few at a time, until they are pliant enough to fold. Warm 1/2 cup canola oil in a large frying pan over medium-high to high heat. To test when it's ready for frying, add a small dab of the egg batter to the pan. If it bubbles and turns golden brown at the edges within 5 to 10 seconds, it's ready. If the batter immediately turns dark brown, the oil is too hot. Once the oil is almost ready, grab a warmed tortilla and fill it with about 1-2 tablespoons each of vegetables and shredded cheese. Fold the tortilla closed—the filling should not spill out; if it does, you have too much. Dredge the tortilla lightly in the flour or gently sprinkle and brush the flour across each side of the tortilla to very lightly coat it. Give the egg batter one more stir. Then, using both thumbs to pinch the tortilla closed, scoop a peneque deeply through the egg batter and place in the hot oil. It should sizzle and puff up into a cloud. Place a dollop of egg batter on the bare space where your thumbs were. Using a spoon, bathe the peneque in the hot oil—this "seals" the batter onto the tortilla, making it easier to flip. Cook for 20 to 30 seconds, then flip with a spatula (or two! ), taking care not to slosh around the hot oil. Repeat with the remaining peneques. Spoon ranchera sauce over the peneques before serving.